Our house had gutters installed on the roof (about 12" above the drip edge of it) and the downspouts went down through the roof and the soffits. They have since been removed and the holes covered up. 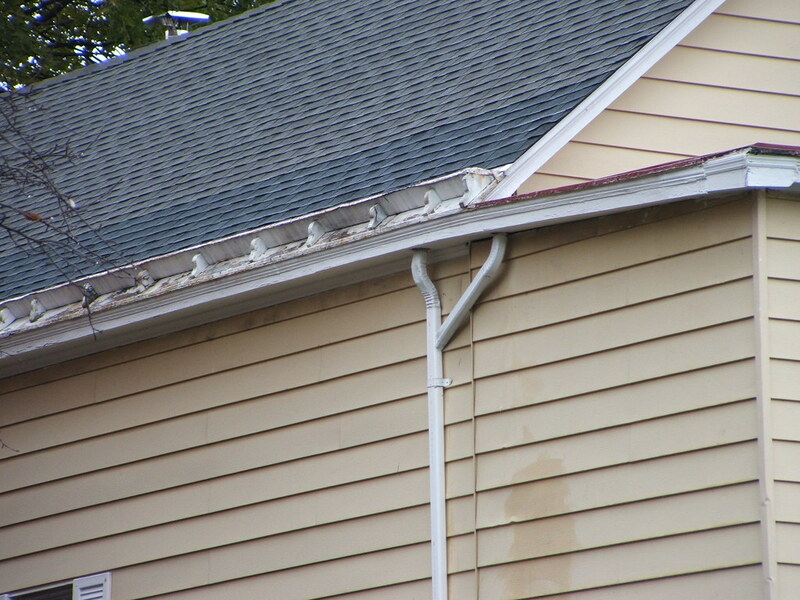 I have seen one other house in this town with this type of guttering system (it is metal). 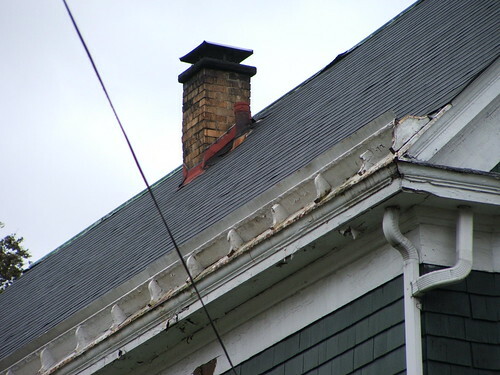 My question is, does anyone know what this type of gutter is called, and also can you still get it? 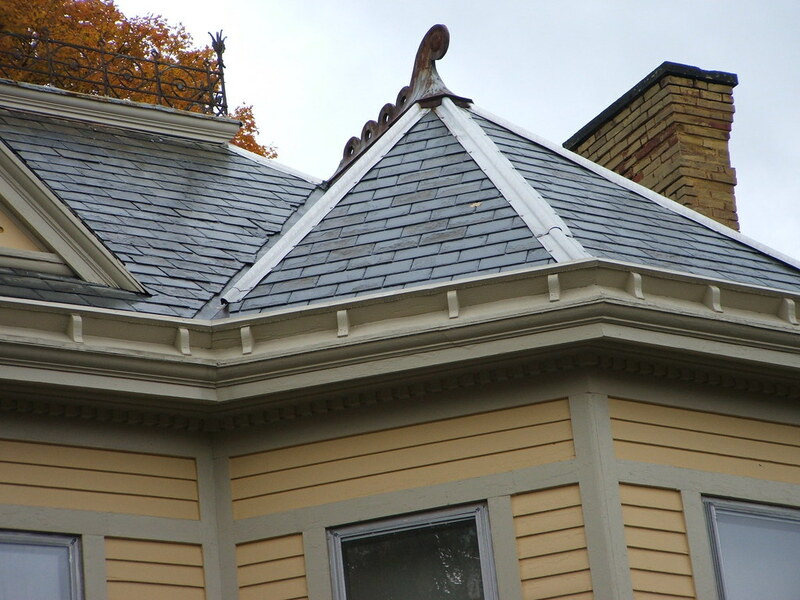 I like the idea of it b/c it does not cover up the trim work on the edge of the house. I did some more searching and found something similar. It is called Pole Gutters. Mine would have been metal and probabaly not copper. The downspouts that are still hanging from the soffits are just regular downspouts. 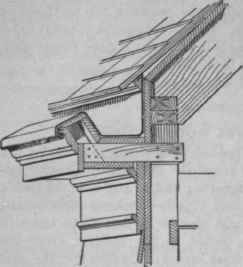 Does anyone know who still manufactures this type of gutter? Can the guys that do the seamless gutters make them? Also, if it would help, there is a small house in town that still has thier gutters up, I can go take a picture of it. 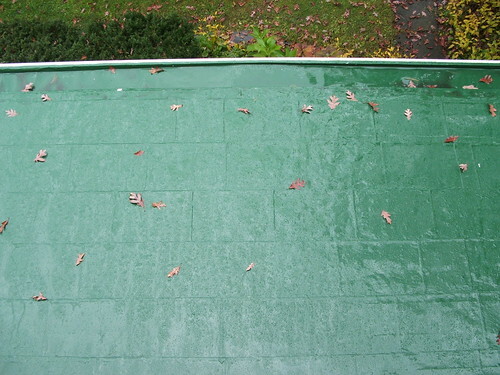 Sometimes these are called "standing gutters:"
Do get some pictures and post them here. 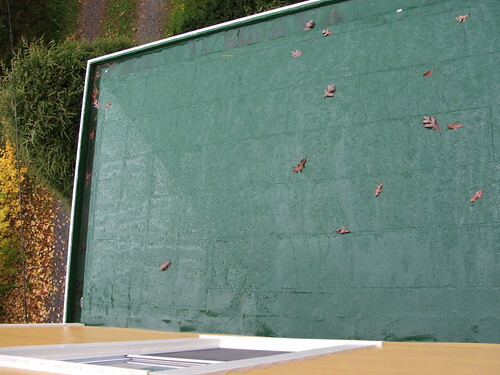 The seamless gutter guys will probably not be able to help you because they just install a standard product. 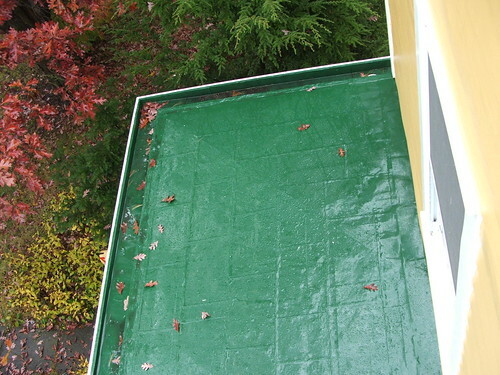 Your gutters were custom built out of basic materials, sheet metal, wood, fasteners, etc. To repair or rebuild them will require the same approach. Posted: Sat Jul 04, 2009 9:21 pm Post subject: Also Called? Yes, in fact, this is what my dad called "yankee gutters," which I had not recalled earlier. 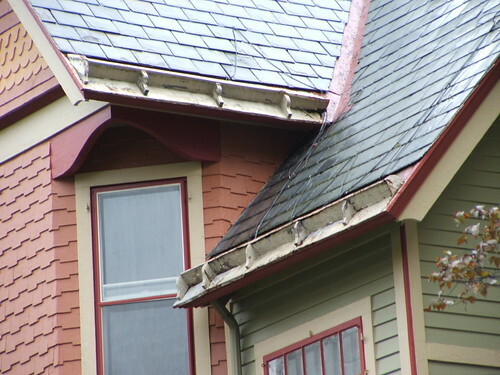 This gutter was well known as a lower cost gutter, compared to a built-in or box gutter. Those yankees were known for their ingenuity and thrift, so this gutter was often called a yankee gutter. 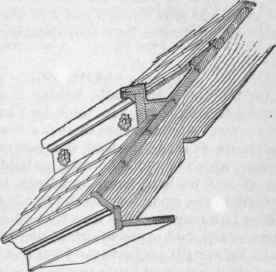 In the roofing and carpentry trades "standing gutter" does perhaps more accurately describe and name it. I was very happy to have found the pictures posted here to this site, and even happier that it is a forum on something that consumes my waking hours. 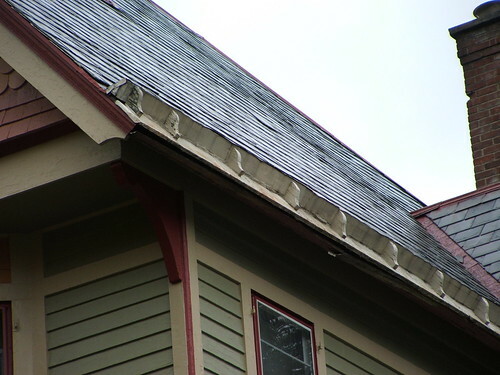 I have just recently restored the yankee gutters on the front porch roof of my house this summer, after having stripped the asphalt shingles off the metal roof and cut out the rotted metal gutters. I'll take some pictures of the finished work once it's stopped raining here and I can walk out on the roof. I can also get some pictures of some houses in the area where the gutters are still attached, if not in use. I'll see what I can get out and about today for the roof-top versions. 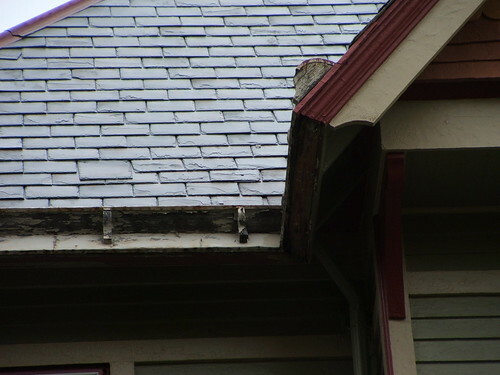 My wife and I just closed on an 1889 Victorian and the porch has a leaking tin roof and installed Yankee (hidden) gutters and needs work/replacement. This is my first Yankee gutter challenge and my thought was to retain the Yankee gutters as I like how the fascia trim hides them but not certain that I want to replace the tin portion of the roof. Instead I'm seriously considering retaining the Yankee gutters while replacing the main porch roof with higher end roof shingles that resemble slate as the main house has good shingles while retaining the Yankee gutters and eventually will replace to match. Since I just closed on the house I need to inspect the main roof further for installation techniques and some minor gutter repairs but porch first. Jerry, welcome to the Forum, and keep us posted on what you find and how you proceed. Jerry, did you take any photos of your gutter work underway? 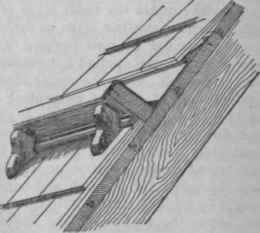 I make these gutters sometimes (if we are talking about the same thing) They use them out in russia on all the old buildings that have metal. I'll try and find my pic. Here are the pictures of our house in the 30's or 40's when the gutters were still on. These would have been metal gutters on the roof, like the metal ones today, except they were about a foot above the roof edge. Anyone know if you can still get them? Top roof, where the line goes across. You can't see much detail on the gutters. Maybe they were wood?